Tax Cut & Jobs Act Passed! On Wednesday both houses of Congress passed a final, reconciled tax reform bill, and yesterday it was signed into law by President Trump. It represents the most significant re-write of the tax code in over 30 years. Comparing the final bill to the original House and Senate bills, it seems as though many of the provisions that differed came out leaning more toward the Senate’s version. I’ll provide a summary following a similar format to my last article. Along the way, I’ll also throw out a few immediate strategies which you may consider acting on before the end of the year, if you can act quickly. The bracket structure that was agreed upon largely resembles the Senate’s version, keeping the current 7 bracket structure, but slightly adjusting some of the income thresholds. The biggest change is that the highest tax bracket rate was reduced to 37%, however the income threshold was significantly lowered so that very high-income earners get to that highest tax bracket sooner and subjects more taxable income to that highest rate. However, for all levels of income, these rates are lower than current tax rates. This new structure goes into effect for tax year 2018 and will revert (“sunset”) to the 2017 tax code starting in 2026 if congress doesn’t act to extend, make permanent, or change it again. Planning item: To the extent possible, if you’re able to defer any of your taxable income into next year it would behoove you to do so. However, even for those that have some control over when they receive income, it’s so late in the game for these types of strategies that if you haven’t already done so, it’s likely not possible. As expected, the final version increased the standard deduction to $12,000 for single; and $24,000 for married filing jointly, and it eliminated all personal exemptions. These changes kick in next year, but also sunset for years after 2025. The Pease limitation (limiting itemized deductions for high income earners) is suspended for tax years after 2017, but like many of the other individual provisions it returns in 2026. As for the specific items, I was glad to see that the final bill followed the Senate’s plan to keep “out-of-pocket medical expenses” as a deductible item. They also kept the added benefit of lowering the threshold for amounts over 7.5% for tax-years 2017 and 2018. It will return to amounts over 10% in 2019 and beyond. Planning item: To the extent you’re able, it may benefit you to pay for as many of your medical expenses as you can before the end of the year – especially if you normally itemize your deductions but think you’ll end up taking the increased standard deduction next year. If you will continue to itemize in 2018, it might still benefit you by accelerating medical expenses in 2018 due to the lower 7.5% threshold. All miscellaneous itemized deductions (i.e. certain items that exceed 2% of AGI), will be suspended for tax years 2018 through 2025. This eliminates the ability for employees to deduct any of their out-of-pocket expenses spent on work related items that aren’t reimbursed by their employers. This also eliminates the ability to deduct investment fees & expenses, as well as any expenses related to the preparation of your tax returns. Planning item: As before, if you’re able to prepay some of these 2018 expenses before the end of the year, you may benefit from doing that. However, these types of deductions are AMT adjustment items and get pulled back into the AMT calculation. So, if you’re normally subject to AMT, this won’t help you. On this point, it seems that the house version won out for the most part. Under the new law existing mortgages incurred before 12/15/2017 are grandfathered so that taxpayers can continue to deduct interest on the first $1,000,000 of mortgage debt on a primary residence. Interest deductions on mortgage loans taken out after 12/15/2017 will be limited to $750,000. Like other provisions, this sunsets after 2025 so that all taxpayers, regardless of when they acquired their mortgage, will again be able to deduct interest up to the $1,000,000 of indebtedness. Lastly on this, as was included in the originals of both House and Senate bills, interest deductions for home equity loans would be suspended and not allowed. This suspension ends after 2025. No changes at all were made to this provision on the final bill. So, taxpayers will still be able to exclude up to $250,000 (single); $500,000 (married filing jointly) of the gain from the sale of a principal residence – as long as the home was used as the principal residence for at least two of the five years prior to the sale. Whereas both original House and Senate bills eliminated the deduction for state & local income taxes, the final bill will allow the deduction. However, it aggregates them with your local property taxes and puts a $10,000 limit on all of it. Planning item: if you are a quarterly tax payer you might want to consider accelerating your 4th quarter state & local income tax payments (not due until January 16, 2018) before the end of the year. As long as it’s for a 2017 tax year liability, the deduction will be allowed on your 2017 tax return. The law does not allow you to get a deduction if you pre-pay any of your 2018 state & local tax liabilities, so that’s generally not recommended. However, that rule doesn’t apply to property taxes, so you may be able to deduct payment for 2018’s property tax if you pre-pay it in 2017. Notes of caution here: I’ve heard, but haven’t confirmed, that you must have an invoice dated in 2017 for the 2018 tax for this to work. Furthermore, if you are normally subject to the AMT (alternative minimum tax) then this won’t benefit you since property taxes are not an allowed deduction under the AMT calculation. Of notable interest surrounding this provision – it was because of this, that the tax bill balanced on the edge of a knife just days before final voting was to take place. Marco Rubio, the Senator from Florida, told the Senate leadership that he would vote against the bill unless the child tax credit was made more generous. In the end, he got what he wanted. The bill increases the total credit to $2,000 per child. Under pressure from Rubio, the amount of that credit that is considered “refundable” was increased to $1,400 (up from $1,000). The bill retains the present-law age limit for a qualifying child – that is a dependent child under the age of 17. The credit is modified even further to provide for a $500 non-refundable credit for qualifying dependents other than qualifying children, which in some cases may help out those that are caring for aged parents, for example. The final bill also significantly increases the adjusted gross income phase out thresholds. The credit begins to phase out for taxpayers with AGI over $400,000 (MFJ); $200,000 (all others). Again, like most of these individual provisions, this enhancement to the child tax credit sunsets after 2025. The final bill did increase the income-based percentage limit that I described in the last article, to 60% (up from 50%) of AGI for cash contributions only. It also denies the charitable deduction of 80% of the amount paid in exchange for college athletic event seating rights. Planning item: For those of you that normally itemize your deductions but believe that the higher standard deduction will prevent you from itemizing in 2018, consider making some or all of your 2018 charitable donations before year’s end. Also, if you make donations to your alma mater in exchange for seating rights, consider making 2018’s gift before year end as well. Going forward for 2018+, for those that are aged 70-1/2 and older that have IRA required minimum distributions: If you take the standard deduction because your itemized deductions (including charitable gifts) are not high enough, then you should be making any and all charitable gifts first from your IRA using a Qualified Charitable Distribution. As expected, the final bill doubles the estate & gift tax exemption to $11.2 million ($22.4 million for a married couple) for estates of decedents dying and gifts made after 12/31/2017. This will sunset back to current law after 2025. The top marginal tax rate was unchanged from the current 40% for estates and gifts over the higher threshold. In my last article, I stated that the original Senate bill didn’t make any changes to 529 accounts, but that was incorrect. There was a provision that I missed that essentially mirrored the House bill. So, it’s no surprise that it was included in the final. The new law will now allow for up to $10,000 per year, per child, to be withdrawn from 529 accounts to be used for K-12 expenses. I was pleased to see that the House bill’s provision to repeal the deduction for student loan interest did not make it into the final piece of legislation. Taxpayers with student loans will still be able to deduct up to $2,500 in interest. Note: the deduction does start to phase out at AGI greater than $65,000 (single); $135,000 (MFJ) and is completely gone at $80,000 (single); $165,000 (MFJ). As discussed in my last article, a welcome provision for special needs planning is the ability to now roll over funds from 529 college savings accounts into ABLE accounts, as long as the beneficiary is the same on both accounts, and as long as such rolled-over amounts don’t exceed the total limit that can be contributed to an ABLE account, per-donee, per-year ($14,000). It also allows ABLE beneficiaries to contribute their own earned income funds to the account even after the $14,000 limit has been reached by gifts from others. For the final bill, congress opted to follow the somewhat “less complicated” Senate version, with some modifications to the deductible amount as well as to the threshold that the W2 based limitation starts to phase in. Additionally, it added a capital element to the W2 based limitation calculation. However, in reading the Joint Explanatory Statement (found here: http://docs.house.gov/billsthisweek/20171218/Joint%20Explanatory%20Statement.pdf) I discovered that 1) the Senate version (and therefore the final bill) is more complicated than I initially understood; and 2) I originally misinterpreted the way that the “50% of wages limitation” comes into play. As I wrote in my last article, I suspected that I was “missing something” as it related to this. This was it. So, I will correct it here. The new law allows the owner to deduct the lesser of: 1) 20% of qualifying business income; or 2) the greater of: (a) 50% of the “total W2 wages” that the business pays with respect to the employment of its employees (not just the W2 wages of the owner as I originally misinterpreted) -or- (b) the sum of 25% of W2 wages plus 2.5% of the unadjusted basis, immediately after acquisition, of all qualified property (i.e. the “capital”). The “50%/25%+2.5%” limitation is waived for taxpayers whose taxable income is under $315,000 (MFJ), or $157,500 (single) (This threshold was lowered from the original Senate version). They can just deduct 20% of their qualifying business income and not have to worry about that whole convoluted formula. Owners of “specified service businesses” (see my discussion in last article) can take the full deduction if their taxable income is under the thresholds described above ($315,000 MFJ; $157,500 single). Owners with taxable income between $315,000-$415,000 (MFJ); $157,500-$207,500 will find that the amount of their qualified business income that they can deduct will be reduced (based on another complicated formula). Owners of these types of businesses with taxable income above $415,000/$207,500 won’t be able to take advantage of the deduction at all. They also modified the definition of “specified service businesses” to now exclude (which is a good thing for these types of firms) engineering and architecture services firms. Examples of the types of businesses that would still fall under this definition are those performing “services in the fields of health, law, consulting, athletics, financial services, or any trade or business where the principal asset is the reputation or skill of one or more of its employees or owners…”. It is this underlined part of the definition that will trap many small businesses into being considered a “specified service business”. I was very glad that they went with the Senate version of this provision, as the House version would have essentially excluded all of the benefits from these types of service businesses. Considering that most of “main street” small businesses in the U.S. are “service businesses”, this would have been a “low blow” to the vast majority of small businesses across the country. This provision is effective for tax years 2018-2025. The final bill does repeal the special rule that has permitted people to undo previous Roth IRA conversions. While this is unfortunate, I don’t think this will kill the Roth conversion strategy. It simply takes a lot of the flexibility out of the strategy during times when the market goes against you in the short-term. However, the decision to do a Roth conversion is really a long-term strategy to transmute IRA gains from the time of conversion into tax-free income in the future; to reduce future traditional IRA required minimum distributions; and to leave an income tax free asset to heirs. In order for this strategy to work really well, it needs time to play out. Using that perspective, not being able to “game” the system anymore using the short-term, 2-year or less gains and losses in the converted accounts means less and less as more time passes. It’s important to mention that this new rule only applies to Roth conversions. Taxpayers will retain the ability to recharacterize regular annual contributions made to IRAs. So, if you make a $5,000 contribution to a Roth IRA for a particular tax year, you can recharacterize that as a contribution to a traditional IRA before the due date of your tax return for that year. The final bill did not include the Senate’s original bill provision to eliminate the ability to select specific “lots” of stock upon sale, gift or exchange. Therefore, this important tax strategy is still available for taxpayers to use for planning out the distribution of assets. As I shared in my last post, as of 2017 the U.S. has the fourth highest top marginal corporate income tax rate in the world, at 38.91%. The worldwide average top corporate income tax rates, across 202 tax jurisdictions, is just 22.96%. According to the Tax Foundation, corporate tax rates have been consistently declining on a global basis for the past 37 years. The average worldwide tax rate in 1980 was 38.68%. As of today, the U.S. is amazingly still higher than the average rate was in 1980! It’s no wonder that for the past 30+ years American companies have been merging with foreign companies or buying them outright in order to shift to a lower tax jurisdiction overseas. The number of companies that have undergone this “corporate inversion” (as it’s called) has increased dramatically just over the past decade. From 1983 (when McDermott, a construction company, relocated to Panama where it had a subsidiary) to 2003 there were 29 major U.S. companies that relocated their tax-base in favor of a lower tax jurisdiction. Then inversions took off and from 2004 to 2014 the U.S. lost 47 more. The Treasury Department, under President Obama, took steps in September 2014, November 2015, and again in April 2016 to make it more difficult for companies to invert. However, to really fix the situation Congress needed to overhaul the way the United States taxes corporations. The final bill lowers the corporate tax rate to just 21%, effective for all tax years after 2017. This is a permanent change. Additionally, the law provides a number of other benefits for businesses (including farming businesses), from increased expensing of certain capital expenditures to granting certain businesses more flexibility in electing the method of accounting they use, as well as eliminating the corporate version of the Alternative Minimum Tax. However, the Congress giveth and the Congress taketh away. There are a number of “take-aways”, such as limiting the deduction for Net-Operating-Losses, repealing a number of deductions and limiting tax-deferred 1031 exchanges of like-kind property to exchanges of only real-property (i.e. real estate). Overall though, the benefits for businesses are overwhelming and some major corporations immediately responded in what seemed to be a coordinated public PR campaign. AT&T said it will pay each of its employees a $1,000 bonus and invest $1 billion into its U.S. networks. Comcast said that it would give its employees a holiday bonus and spend more than $50 billion over the next 5 years to expand its broadband capacity. Wells Fargo will raise the minimum wage it pays to hourly employees to $15/hour and Fifth Third Bank announced they will also raise their minimum hourly wage to $15/hour as well as give a bonus of $1,000 to all employees. Whether or not this was a PR stunt, it can’t be argued that these moves aren’t helping the employees of these companies. Aside from all of this, personally I’m in the camp that believes that lowering corporate taxes will have a very positive long-term effect on the growth of our nation’s economy by encouraging business investment for the next several decades. I believe the U.S. will now be in a very competitive position to bring companies back, create jobs and stimulate the economy, which will be good for every American. As we talked about before, U.S. corporations are collectively holding $2.6 trillion in cash overseas that has not yet been taxed by the U.S. Government. Current law allows a foreign subsidiary that is owned by a U.S. company to avoid paying U.S. tax on its net income until the income is distributed as a dividend to the U.S. company. The final bill does include the “deemed repatriation” provision which essentially taxes all of the previously un-taxed “earnings & profits” (E&P) of the foreign subsidiary at a rate of 15.5% for cash, and an 8% rate for E&P that has been reinvested back into the foreign subsidiary’s business (e.g. property, plant, equipment). Lastly, going forward instead of using a “worldwide tax system”, the U.S. will now tax multinational companies under a modified “territorial system”, which is a more neutral policy whereby taxes should play less of an influence in the economic decisions of businesses. Please let me know if I can help you with any of your financial and tax planning goals in the new year! Disclaimer: The information above is not intended to be tax or legal advice. 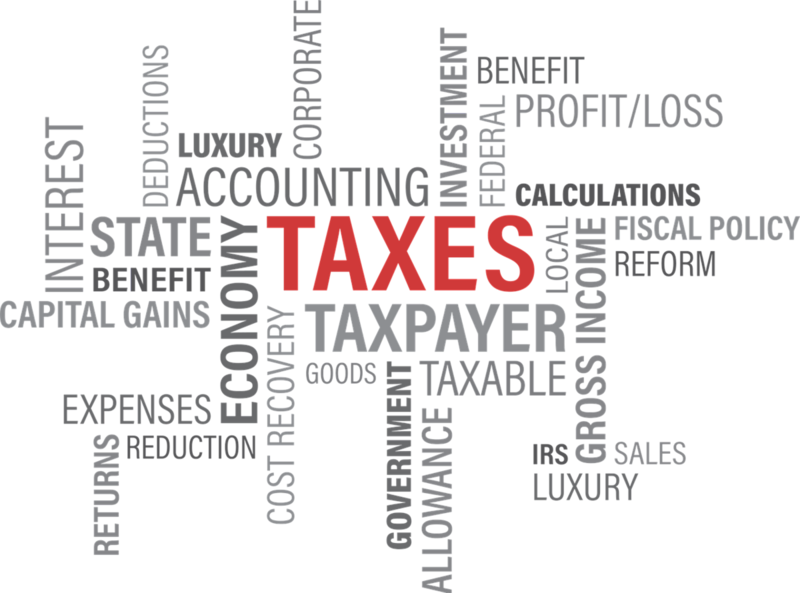 Please consult legal or tax professionals for specific information regarding your individual situation. This information was developed from sources believed to be providing accurate information.